In this occasional series featuring weird knives we come across in our research, we’ve seen some pretty impractical designs (Shark Knife, I’m looking at you). This next entry follows that same vein of impracticality to a tee. 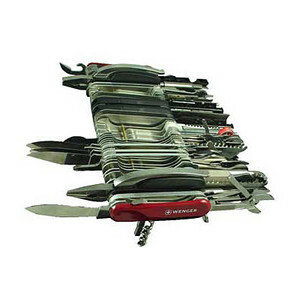 The aptly named Giant Swiss Army Knife is a monster with 85 tools built into a single folding knife. As you can see from the picture, the massive block is huge and unwieldy. It weights a whopping 2lbs, 11 ounces and measures almost 9 inches wide. While I think the idea is novel and pretty cool, the knife itself is just outrageous. Can you imagine trying to saw something, use those baby scissors to cut or open a bottle of wine as you hold the other 84 tools simultaneously? My only other qualm with this giant knife is that there are not one, but two keychain rings. The bigger Swiss Army knife models felt a bit heavy attached to my keys, so I can’t even imagine what this thing would feel like dangling from my house keys. If you’re thinking about picking up one of these behemoths, it’s going to cost you $999. 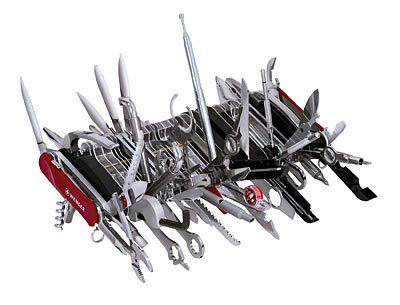 Unless you’re really into knife collecting, I’d recommend checking out a more practical version of the Swiss Army knife. Here’s another image of the knife with all its tools in the engaged position. it largely inside the United states and U.K. earlier this 30 days. connection (no video and voice yet, those need a plug-in installing).